I stood up to open the window because I thought I had heard thunder, and instead was treated to a lovely little double rainbow. 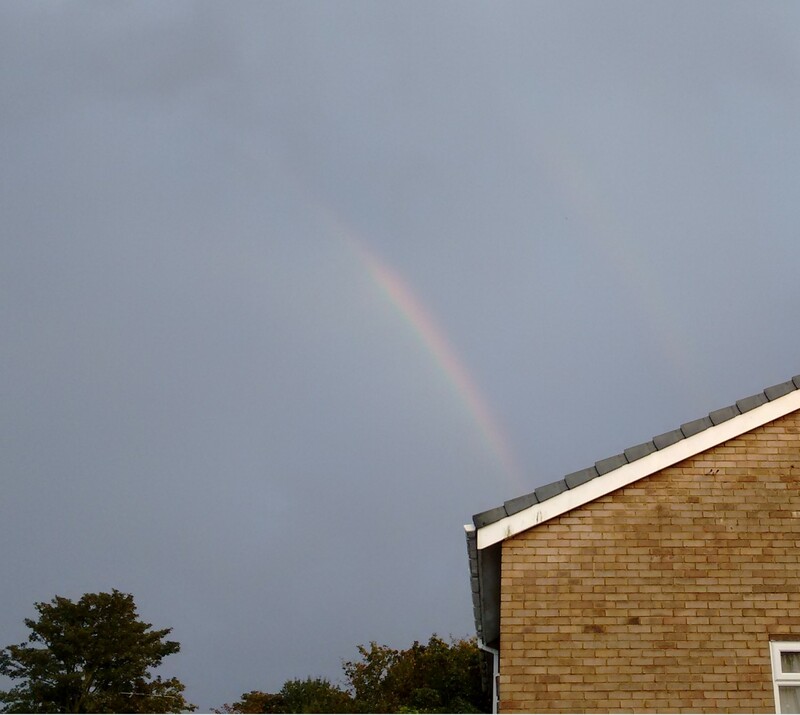 It was only there for a minute or so, and the second rainbow started going before I could get a camera on it, but you can just about see it if you squint. I failed in my plan of not getting dressed or moving; I decided to tag along with Z to pick up the girls from his parent’s house. The subject of our new bed came up — yes, bed. We originally were just trying to get help obtaining a new mattress ’cause our current one is over a decade old, but how easily we’re talked into thinking bigger and better. We know that we want a super-king, and we want a base that has drawers in it. Beyond that, we’ve not gotten too far. We think we’re in agreement to get a medium firm mattress, but what sort, etc. There are so many different types, and we were told to look for quality (and given a *very* generous price range to look within). So yeah, once again they are ridiculously awesome, and helping us fill our house with quality furniture. Eternally grateful, y’all. I also failed in the not moving thing because I got my corpse moving to help with chores. Z was visibly frustrated, so I got my brain in gear trying to get my body moving (yay, executive dysfunction -__-), and managed to not be a total waste. I got the brown couch cleared off, and all four of us actually worked together to get the floor cleared. Littler was so happy she immediately started dancing; Z then pointed out there would always be room to dance if they picked up their toys. The vacuum still needs to go around, but yeah… world of difference. I just wish I could get them to appreciate that we need them to keep on top of their toys, because we’re not always going to have it in us. Maybe we’ll luck out and get them to do their room… and pigs might fly, ha ha. Beyond that, not thrilled that the weekend is nearly over, but oh well. It’ll be back before I know it.